This book brings together an influential sequence of papers that argue for a radical re-conceptualisation of the psychology of inference, and of cognitive science more generally. The papers demonstrate that the thesis that logic provides the basis of human inference is central to much cognitive science, although the commitment to this view is often implicit. They then note that almost all human inference is uncertain, whereas logic is the calculus of certain inference. This mismatch means that logic is not the appropriate model for human thought. Oaksford and Chater's argument draws on research in computer science, artificial intelligence and philosophy of science, in addition to experimental psychology. The authors propose that probability theory, the calculus of uncertain inference, provides a more appropriate model for human thought. They show how a probabilistic account can provide detailed explanations of experimental data on Wason's selection task, which many have viewed as providing a paradigmatic demonstration of human irrationality. 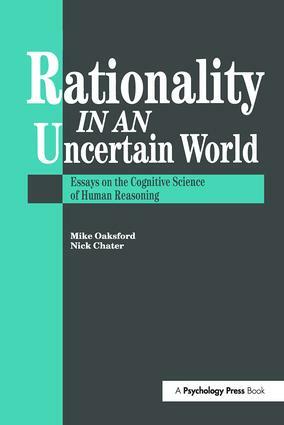 Oaksford and Chater show that people's behaviour appears irrational only from a logical point of view, whereas it is entirely rational from a probabilistic perspective. The shift to a probabilistic framework for human inference has significant implications for the psychology of reasoning, cognitive science more generally, and forour picture of ourselves as rational agents.